In 1984 KLM conducted a remarkable re-enactment of the Uiver’s race flight using the world’s only airworthy DC-2 at the time, flying from Mildenhall to Melbourne. The crew of the 1984 50th Anniversary flight. 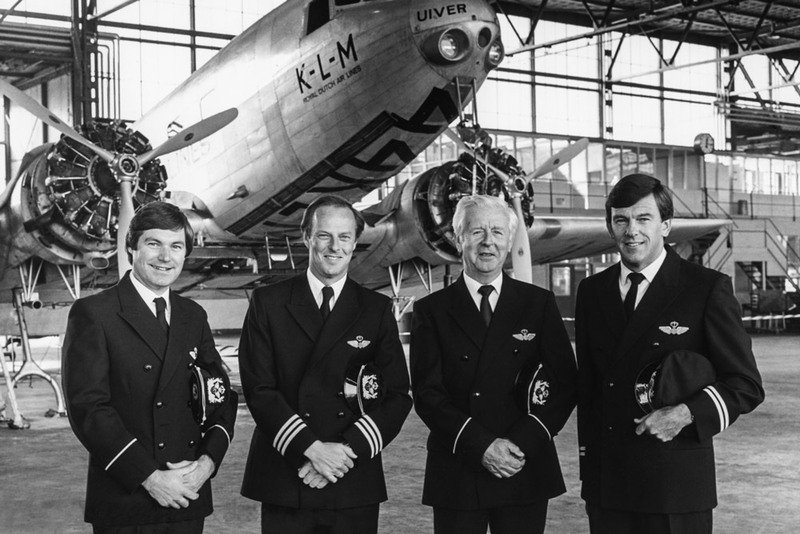 Left to right: Ton Degenaars (Flight Engineer), Jan Plesman (Captain), Bonne Pijpstra (Flight Engineer), Fred Schouten (First Officer). Image courtesy Aviodrome, NL. Listen to the amazing story of the Uiver presented by Denzil Howson (1918-2005). These documentaries were made for the 50th anniversary and were broadcast by the ABC. The recordings are kindly supplied by the Denzil Howson Archive. “Initiative for the Dutch entry in the 1934 London to Melbourne Centenary Air Race was taken by KLM director, Mr Albert Plesman. This year, Mr Albert Plesman’s grandson Jan Plesman, 38, a three-stripe First Officer on KLM jumbo jets is commanding a new ‘Uiver’ in an historic re-enactent of the 1934 flight. The initiative for this re-enactment came from Mr Rob Swanenburg, a television producer with The Netherlands Broadcasting Corporation (NOS). Five years ago, Mr Swanenburg was bitten by the aviation bug, during a visit to an English aviation museum. Since then he has been working in the seemingly impossible task of organising a repeat of the 1934 race, with the assistance of retired air historian, Mr Fred Zandvlit. The search for an airworthy DC-2 took Mr Swanenburg around the world. Of the four DC-2s still in existence, only one plane was at that time airworthy. The plane is owned by an American physics professor, Colgate W. Warden, operator of an aviation museum in South Carolina. For the flight to Australia, Mr Warden was only too happy to make his favourite plane available – otherwise he prefers to remain in the background. Before Mr Warden’s DC-2 was shipped to Holland for an overhaul, it was repainted in the original Uiver’s colours, marked on the tail with the original race entry number 44, and baptised as the Uiver. In the best Dutch tradition the new Uiver, after transportation from the United States to Holland was transshipped by canal from the seaport to Schiphol Airport, near Amsterdam. Stripped of wings and tail, with engines sealed to protect against rust, the new Uiver glided majestically along the waterways, perched atop an 88m long, 12m wide push-pull barge. The plane filled some canals from bank to bank, right to the edges of adjoining household gardens, and during the 150km journey it was cheered by thousands of enthusiastic crowds. On arrival at Schiphol Airport, the new Uiver was lifted from the barge by a huge crane, over the airport fence, where it was towed to a hangar for overhaul. Last December 18, the newly-overhauled Uiver took off from Schiphol Airport to Mildenhall for the start of the commemorative re-enactment. From Mildenhall, the new Uiver was flown to Marseille, Rome, Athens, Larnaca, Aleppo, Damscus, Kuwait, Abu Dhabi, Muscat, Karachi, Jodhpur, Allahabad, Calcutta, Rangoon, Bangkok, Alor Seta, Kuala Lumpur, Singapore, Jakarta, Rambang/Selaparang, Kupang, Darwin, Cloncurry and Charleville. The new Uiver is expected to land at Albury Airport (not the racecourse) at 5.10pm today. It is not the intention of the re-enactment to match the original Uiver’s flight time, nor can the exact route be duplicated. Two airfields on the 1934 route cannot be used, Jask in Iran is not available due to the Iran-Iraq war, and Rambang Airport in Indonesia no longer exists. Abu Dhabi and Rambang/Selaparang airports are to be used instead. In 1934 a pilot could simply plot a direct course from one point to another; in 1984, pilots must strictly adhere to air corridors and holding patterns. The most important reason for the somewhat prolonged re-enactment is the production of a three-part television documentary covering the re-enactment and recalling the epic 1934 flight. A film team from The Netherlands Broadcasting Corporation is travelling with the new Uiver, shooting scenes at each airport. Major filming for this documentary will take place in Albury, where extra film crews have travelled direct from Holland to assist production. 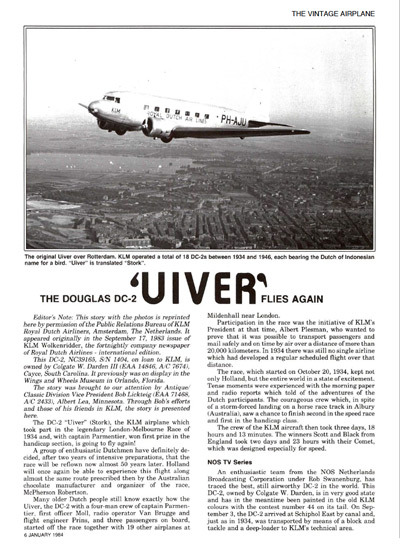 Read ‘The Douglas DC-2 Uiver Flies again’ from the January 1984 edition of The Vintage Airplane. Reproduced courtesy of the Vintage Aircraft Association. The 50th Anniversary re-enactment flight leaving Albury Airport in 1984. Video by (Dr) Vin Thomas.